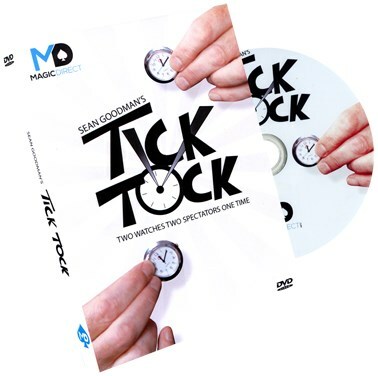 Magic Direct presents Sean Goodman's Tick Tock. Two watches are handed to two spectators to examine. Each spectator unclicks the crown of their watch and turns it - the hands spin freely and fairly. The watches are now held face down and each spectator turns the crown until they feel the urge to stop - the crown is now clicked in place, the time is set. The times on both watches match. Perfect!!! Clean direct magic that is easy to perform and different - packs small but plays BIG. Instantly reset. Tick Tock by Sean Goodman can also be performed so the matching times are different after each performance. Tick Tock comes complete with the necessary watches and comprehensive DVD which offers alternative time matching scenarios with cards and coins (cards and coins not included). Two watches. Two spectators. One time - the time to let your audience experience the magic that is Tick Tock!